Remember to fill out the iGEM 2012 HS Survey! Online registration is now closed. Registration will be available on-site! Teams will be able to practice on Friday June 29th, from 6PM to 8PM in 30 minute blocks. 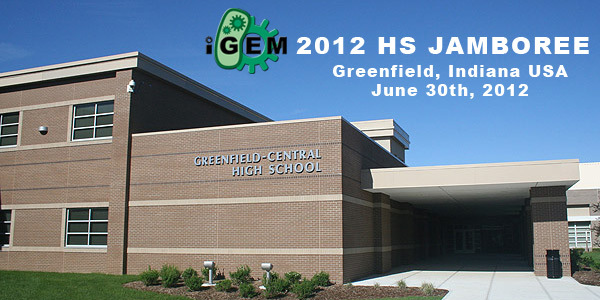 Special rate of $69/night for iGEM HS teams! Call (317) 467-0999 for reservations. Teams flying into the area should choose Indianapolis International Airport (airport code: IND) as their destination airport. There will be a shuttle from the Greenfield hotels to Greenfield Central High School in the morning and evening of the Jamboree.